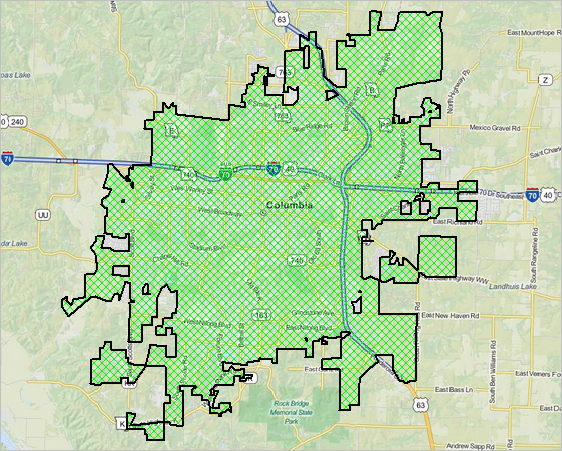 This section reviews tools that you can use to develop your own map(s) that show city(s) of interest. 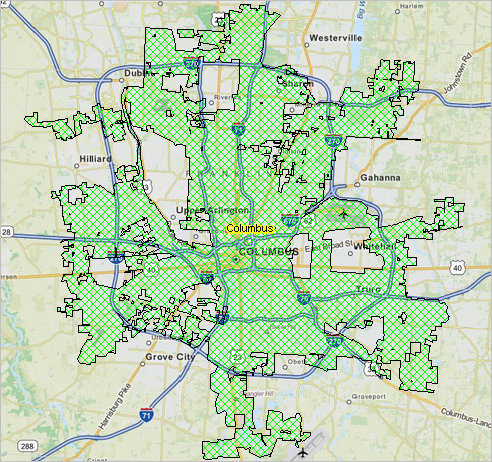 See more about using Geographic Information System (GIS) tools. 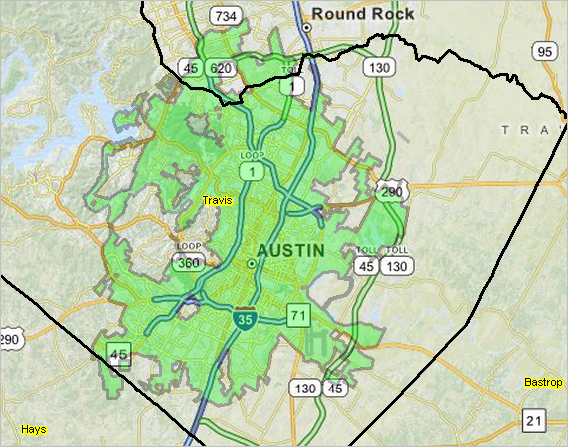 The city boundary shapefile used in the cities/places GIS project described here creates city boundaries that are very precise. 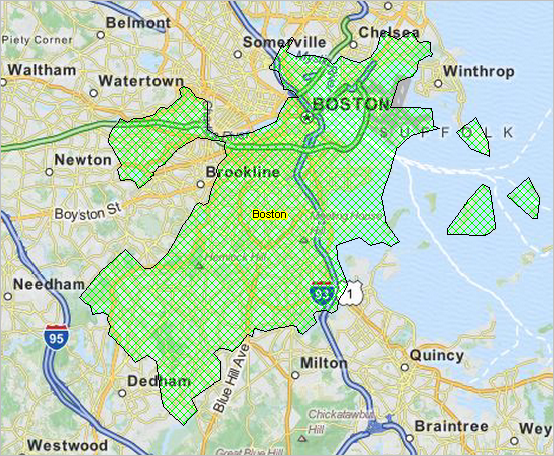 The GIS resources enable you to view/show the city boundaries in context with roads and other geography. Flexibly add labels. Create pattern views. Add your own data. City maps can be saved as a graphic and used in any manner. There are no fees to use resources described in this section. Click graphic for larger view. See more illustrative views below. 4. Done. The start-up view is shown below with additional instructions. A supplementary and different set of data, software and analytical resources are provided as a part of the ProximityOne User Group. ACP participants are automatically enrolled in the User Group. Members may download and use selected resources on their own computers. Join now ... there is no fee to participate. 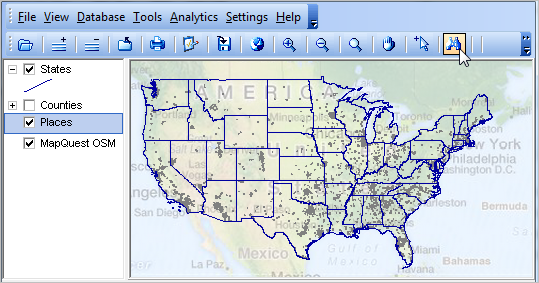 While the c:\cvxe\1\cvxe_us_places1.gis is opened, the view shown below appears. The map shows state boundaries and city/place boundaries. Optionally "click-on" the county layer shown in legend at left to show county boundaries also. Use the Find/Query feature to locate a city of interest. Fill in the form and click Find button. City of interest will appear with yellow fill pattern. The form must be showing the Places layer, the Name field, the "like" operator, and the exact case-sensitive name to be located. 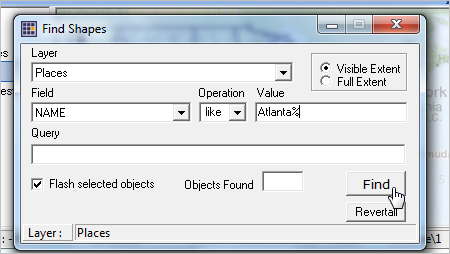 The name to be located shows in the example as "Atlanta%" (no quotes). The % symbol wildcards the remainder of the name. When using a frequently used/very common/ name, consider zooming in to a state and using the search setting "in visible extent" to narrow the scope of possible hits. Atlanta is located/highlighted as shown below. The zoom and pan navigation tools are used to get the following view. Click the RevertAll button on the Find/Query form to remove the yellow fill pattern. Close the Find/Query form. Use the Layer Editor to adjust the view to the zoom-in and larger final view shown at the top of this page. You will then be prompted for the folder and filename. Once the graphic has been saved to a folder it can be used just as any other graphic. If CV is closed with no changes made to the project settings are saved. Reopening the project will create the same start-up view as shown above. Repeat the steps to create views for other cities. If you have made adjustments to the project and want to save it, to be reopened later with the same view, use File>SaveAs to save a new project name. It is recommended that you do not save the project with the same name(c:\cvxe\1\cvxe_us_places1.gis) as you will not be able to recall the original start-up view. Consider saving the project with a name like "c:\cvxe\1\cvxe_us_places1_richmondva.gis" for a zoom-in view of Richmond. VA. Later, when you start CV XE and want to open your saved project, use File>Open>Dialog and select "c:\cvxe\1\cvxe_us_places1_richmondva.gis". Join us in a DMI Web session (more information) where we do illustration applications on a Q&A basis. See the schedule and join in!